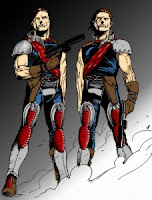 MTV Movies asked Rhett Reese and Paul Wernick if the Cobra's Crimson Twins, Tomax and Xamot could make an appearance. While the guys who wrote Zombieland didn't confirm the twins would be in the sequel, they definitely didn't deny it. When first asked, Reese and Wernick began laughing. Reese quickly remarked, "I can't say." The writer then added, "You may have just read it off my face but I can't say." In the playback of this interview it is clear that Reese is implying that the appearance of the Crimson Twins is a valid, but again he is not at liberty to say. The MTV interviewer pushed the writers expressing how good Tomax and Xamot could be if done right. Rhett Reese solidified those sentiments by saying, "It could be a disaster." For those of you who do not remember the Crimson Twins, they have telepathic powers and feel each others pain. 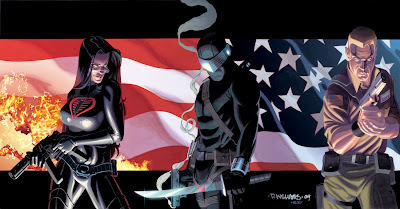 Paul Wernick then gave what seems to be a nod that the Twins will be in the upcoming G.I. Joe sequel. He said, "We hope to do it right." Long time Joe fans have to be pumped by this news. What makes the news/rumor even more enticing is the fact that Rheese and Wernick seem to have the right talent to get it done correctly. They did a bang up job with Zombieland and seeing what they can do in the G.I. Joe universe is exciting. Especially when you hear stuff like this! Tomax and Xamot were two of my favorite figures to play with as a kid and the idea of seeing them on the big screen in G.I. Joe 2 is mouth watering!